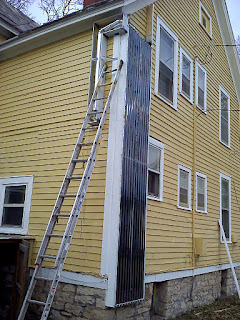 Last fall, forum user Menaus2 installed a solar hot air panel on one of his rental properties. He didn’t have a lot of width to play with, so he decided to make the solar panel taller to increase the amount of collector area. The construction is fairly straight forward. The sides are made of 2x8s. 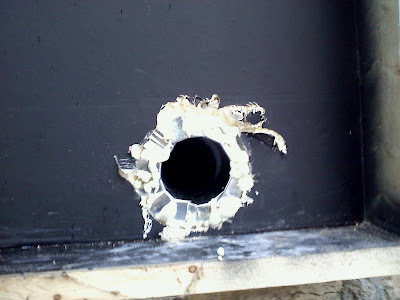 Inside the 2x8s is a layer of polyiso rigid foam insulation. The top and bottom both have a 4″ duct hole cut in them for the air to flow through. 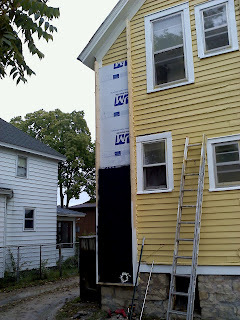 The area was later painted black along with everything else. Next, two layers of aluminum screen were mounted into the collector to absorb the heat and transfer it to the air moving through the panel. 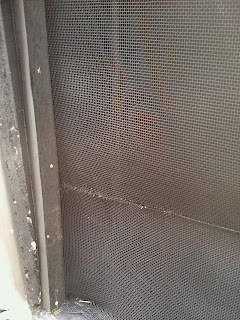 Lastly, the collector is sealed off with a layer of polycarbonate. To improve the efficiency of the collector, Menaus added a small squirrel cage fan similar to a bathroom ventblower fan. It is controlled by a plug in thermostat that is commonly used in greenhouse type applications. Over the winter, Menaus said that on a sunny day the solar collector would raise the temperature of the kitchen pretty consistently around 5 degrees fahrenheit. For more information, see Menasus’ forum thread.